An important factor in the abolition of slavery was the impact of those enslaved people or freed former slaves that fought for freedom and their rights. From the very beginning there were slave revolts. The most successful slave revolt was that on Saint Domingue. A chain of rebellion began when French planters would not grant the freed former slaves citizenship as decreed by the National Assembly of France in its "Declaration of the Rights of Man." A campaign organised by a wealthy, freed man Vincent Ogé to claim voting rights for coloured people, in October 1790, was brutally crushed. This was followed by several slave uprisings. A bloody, thirteen-year war followed that eventually create the first independent black nation in the Western world. At first the rebels fought for the Spanish against the French under the leadership of commanders such as Toussaint L'Ouverture. When the French abolished slavery, Toussaint L'Ouverture joined the forces of the French Republic as a brigadier general, and turned his troops against Spain. In 1797, Toussaint was made commander-in-chief of the island by the French Convention. Following the defeat of the Spanish and British forces, Toussaint began moving toward independence from France. In 1802, Napoleon Bonaparte, who had seized power in France in 1799, sought to restore slavery to the West Indies. Toussaint was captured and exiled, but the fighting continued under the leadership of Jean Jacques Dessalines and Henri Christophe. 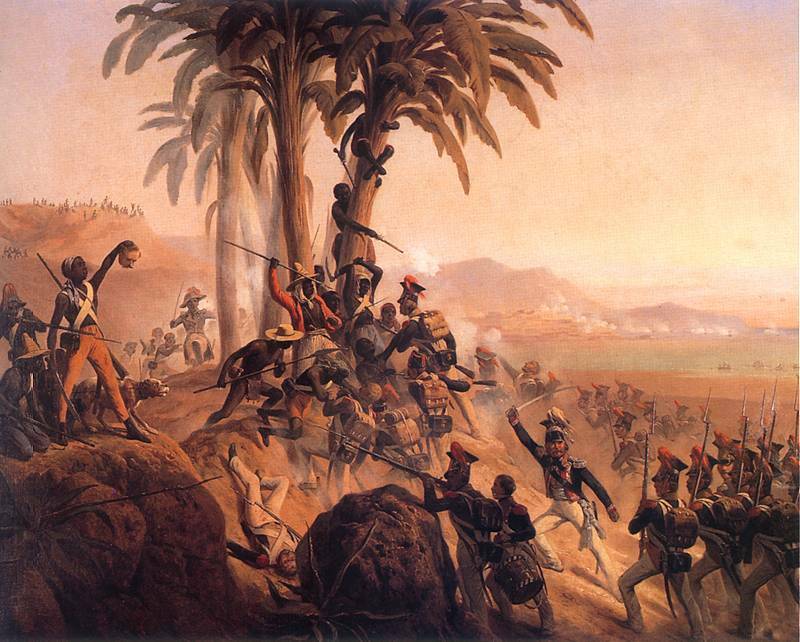 On January 1, 1804, Dessalines proclaimed himself ruler of the new nation, which was called Haiti, a "higher place." Battle on Santo Domingo, a painting by January Suchodolski depicting a struggle between troops in French service and the Haitian rebels.